Benjamin Chang was born near Shanghai, China. From an early age he was drawn to all forms of Art and loved drawing, painting and sculpting. During the Cultural Revolution he was sent to a farm but his yearning for artistic expression could not be contained and soon rakes were inverted to create paint brushes in the mud. Leaves, branches, grasses, rocks and river stones were collected and repurposed to create sculptures showing the bounty of nature's colors and shapes. Soon the townspeople noticed his creations and word of his talents spread all the way to Beijing. 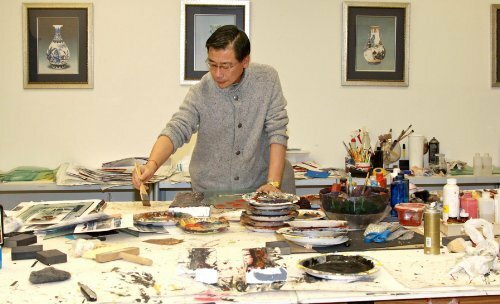 After seeing his work, the Chinese Government brought him to Beijing and dedicated his time to creating art for the Party. The visibility of these projects soon brought international attention. Recognizing his talents and future, San Francisco's Academy of Art University gave him a full scholarship for a Master's Degree. Ben fell in love with San Francisco and chose to make the City his new home and today all of his designs and creations begin in his San Francisco studio. Most of his art pieces reflect his heritage and have a distinctive East meets West inspiration. Nature -- which provided all of the colors and shapes of his earliest creations-- has a recurring theme in his work. His chosen medium is Fused Glass because its sculptural qualities can be combined with painting to create truly unique pieces. Ben has always believed that everyone should enjoy the beauty of art so he pioneered techniques to make his art affordable. Today a guild of artists selected by Ben and taught by Ben recreates his work to achieve his affordable mission. Although Ben receives large public commissions for one of a kind pieces, he has found affordable art his greatest joy because it has brightened the lives of so many. What began in a small village today encircles the globe and his art is found in Asia, the Middle East, Africa, Europe and North and South America. Ben hopes you enjoy the luminous colors and captivating shapes of your chosen piece. He is honored to be in your home.